We understand the importance of keeping your equipment running, and our parts and technical support team is available 24 hours a day, 7 days a week to do just that. Our team travels the world to install your equipment, provide plant evaluations and support you and your equipment to produce quality products year round. Contact your Besser Sales Representative for additional information. Providing lifelong, attentive customer service is the cornerstone of Besser Company. Producers using Besser equipment around the globe have 24/7 access to customer support including a worldwide parts supply network, expert technical service and in-plant training. We pride ourselves in providing industry leading service after the sale to assist producers in maximizing plant efficiencies and profitability. As energy costs continue to increase, Besser works with you to reduce maintenance and energy costs for your curing systems. We provide knowledgeable, trained service technicians that will optimize the performance of your system, improve its efficiency and reduce wasted energy through tuning and optimization that meets all local codes and CSA and emission standards. 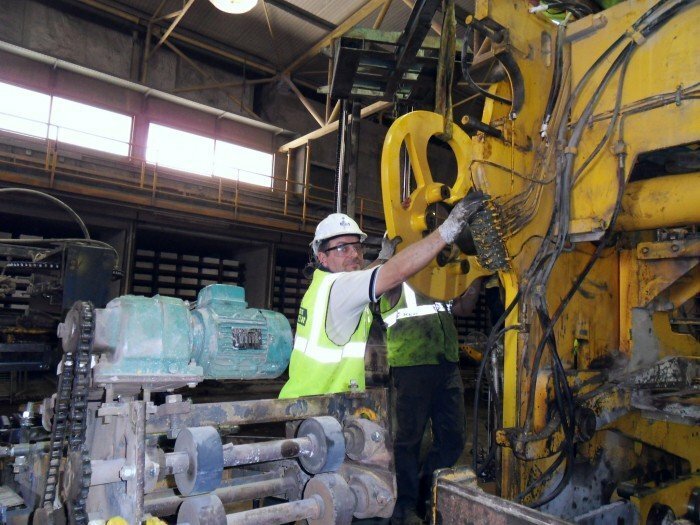 We’re available to provide cost-effective plant evaluations that will help you maximize the production and efficiency of your pipe or block plant. Our technical service representative will travel to your site to evaluate your equipment, procedures, processes and provide you with a written report that cites deficiencies and suggests solutions. We’ll make sure that you’re aware of the ever-changing technology that can positively impact your plant. Our staff will install these upgrades and provide instructions to your staff on their proper operation. We can rebuild your equipment at our facility or at your plant depending upon complexity. We can also disassemble and relocate your equipment. All services are done and or completed by Besser staff. Besser offers in-plant training for the staff in your block, hardscape, pipe or precast plant. Our instructors will travel to your facility and provide training customized to your staff’s specific needs and address process improvements to maximize your efficiency, product quality and profitability. Instruction will take place in your plant, using your equipment so your entire learns together making them a more cohesive and highly functioning team. Preserving your equipment’s reliability is our goal. Our planned maintenance programs are designed to boost your product quality, maximize your productivity and minimiz your downtime. Through routine inspection of your equipment, necessary adjustments can be made and worn parts can be replaced to prevent downtime.